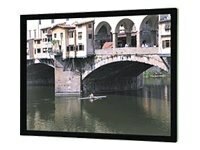 The Imager is a perfectly flat, permanent wall-mounted screen ideal for video projection. Projection Fabric is attached to the frame by Velcro. Black powder coated aluminum frame provides a sleek black masking border. Da-Mat is a smooth, white, vinyl finish surface for precise image reproduction. Provides an exceptionally wide angle of view with little loss of resolution. It is a highly flexible unsupported vinyl fabric and may be folded or rolled. Screen surface can be cleaned with mild soap and water. Flame retardant and mildew resistant. Pro-Trim is a fabric covering that aesthetically enhances the appearance of the installation. Pro-Trim provides a stylish masked border while absorbing the light that surrounds the viewing area.